Some say that the secret of a delicious dish is in the sauce. The base of many sauces contain dairy products such as butter or milk and sometimes egg. Especially sauce hollandaise that contain both butter and egg is not accepted in the vegan diet. As the preparation of these sauces is already challenging in the traditional way, the consumer will look for more convenient vegan alternatives to use at home. This is opening great opportunities to food manufacturers. At KaTech we have developed several sauces, that can be produced either UHT, pasteurised or sterilised to provide the desired shelf-life. 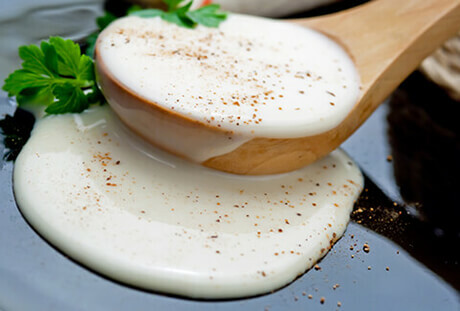 We have solutions for vegan sauce hollandaise, vegan sauce béarnaise, vegan pepper sauce or vegan sauce béchamel and many more. Are you interested in our developments or do you have any other requirements? Please get in contact with us to benefit from our expertise in vegan stabiliser systems and emulsifiers. Eating white asparagus and other vegetables with sauces hollandaise is very popular in Europe but far from being vegan. To give vegan consumers the option of eating a popular sauce, the right replacement for egg and butter needs to be found. Stabiliser systems with their functional ingredients will help to match the traditional sauce and get close to the eating experience. At KaTech we have developed several vegan alternative sauces to hollandaise sauce, sauce bearnaise, sauce bechamel or pepper sauce. All products can either be UHT, pasteurised or sterilised to provide the desired shelflife. We also have lots of different solutions to adjust the right fat content together with the right texture to cover the vegetables eaten easily. If the final product does not have the smooth texture the consumer is looking for, there might be issues during the process. Most of the time the stabiliser system is not adapted to the process parameters which can have a big effect on the final product. Especially plant based emulsifiers are very sensitive during the process and could lead to an unstable product. At KaTech we can give you the right combination of functional ingredients to achieve the final product you are looking for. Please get in contact with us, to find out more about our expertise in vegan sauces. At KaTech we have a lot of expertise to look at optimising costs edsxof recipes, while taking the process and ingredients of our customers into consideration.